Ruth Young (1688-1768) is #283 on my Ahnentafel List, my 6th great-grandmother, who married #282 Samuel Brown (1686-1749) in 1708 in Eastham, Massachusetts. * their daughter, #141 Mehitable Brown (1714-1758) who married #140 Thomas Dill (1708-1761) in 1733. * their son, #70 Thomas Dill (1755-1836), who married Hannah Horton (1761-1797) in 1782. Ruth Young was born in about 1688 in Eastham, Massachusetts, the 5th child of eight born to John and Ruth (Cole) Young of Eastham. "Samuel Brown senr and Ruth Young were married by Joseph Doane Esqu^r the twenty first day of October Anno dom 1708." They had ten children born between 1709 and 1732, but only the first five were recorded in the town records. 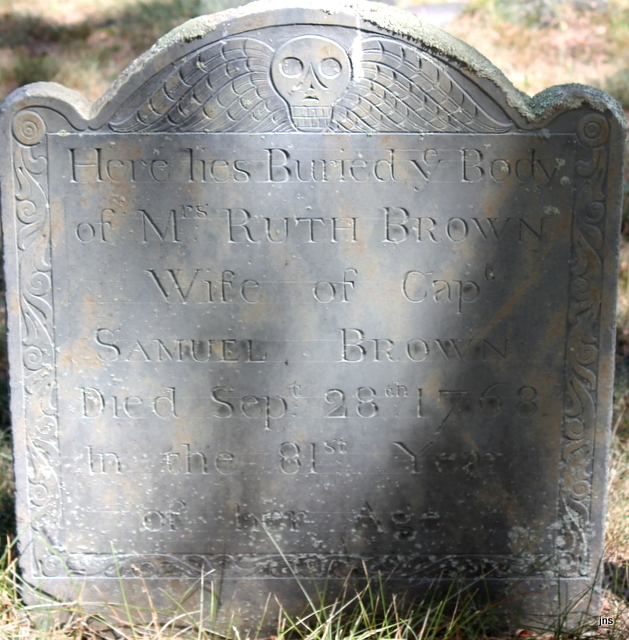 "The parties hereto do hereby mutually agree that Samuel Brown and his wife Ruth Brown shall have for their part of the abovesd Estate to be by them Their Heirs and assigns for Ever freely possessed and Enjoyed The one third part both for Quantity and Quality of the abovesd Twenty acre Lott lying in sd Harwich and also Sixteen pounds and five shillings in full of their parts of y^e abovesd Estate." "Imprimus I give to my Beloved wife Ruth the whole Improvement of my Grist mill and fulling Mill During her Natural Life and the one half of my Dwelling house During her Natural Life and one feather Bed and Sutible furniture thereto and for her to have as much household Stuff to Improve as She shall have Occations for to use During her life and she shall have that Land and Meadow to Improvement that Lays to the Eastward of the mills that is fensd in and if what I have already set apart for her be not Sufficient for her Comfortable Subsisance. My will is my son Isaac shall help her to what she shall have Occation for." There are no probate records for Ruth Brown in the Barnstable County Probate Records. 1. "Massachusetts, Town Clerk, Vital and Town Records, 1626-2001," database with digital images, FamilySearch (http://familysearch.org : accessed 28 March 2016), Barnstable County, "Eastham, Orleans, Births, Marriages, Deaths, Land Grants, 1649-1722," page 73 (image 138 of 157), Samuel Brown and Ruth Young marriage entry, 1708. 2. Col. Leonard H. Smith, Jr. and Norma H. Smith, Vital Records of the Towns of Eastham and Orleans (Baltimore, Md. : Genealogical Publishing Company, 1993), page 36, Samuel Brown Senr and Ruth Young marriage entry. 3. "Massachusetts, Wills and Probate Records, 1635-1991," indexed database with digital images, Ancestry.com (http://www.ancestry.com), Barnstable County, "Vol. 1-3, 1686-1747," Volume 3, page 455 and 514-516, John Young probate papers. 4. Massachusetts, Wills and Probate Records, 1635-1991, indexed database with digital images, Ancestry.com (http://www.ancestry.com), Barnstable County > Probate Records, Vol. 8, 1745-1753, pages 238-242 (images 137-139 of 309, Samuel Brown, will proved 4 April 1749. 5. Jim Tipton, indexed database, Find A Grave (http://www.findagrave.com), Duck Creek Cemetery, Wellfleet, Mass., Ruth Brown memorial #36637888.